"No matter how many times everyone makes dumplings together, no one else can do it like my grandma." The 2019 Chinese New Year officially begins on February 5, and the celebrations continue through February 19. But many Chinese families start gathering and preparing for the festivities the week before New Year’s Day, so you know there’s a lot of time for intense feasting. 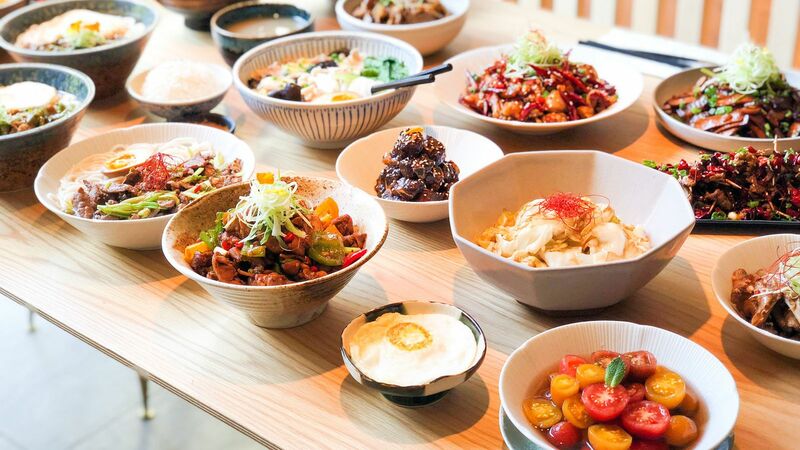 As the 2019 Year of the Pig extravaganza approaches, some of our favorite Chinese chefs and restaurateurs are here to tell us about their favorite Chinese New Year memories and how this special time is about family, fireworks, and, of course, fantastic food. What is one of your favorite Chinese New Year memories? "When I was four years old, my mom brought me back to my grandma's house in northeast China for the first time. It was three days of train rides from Beijing to my grandma's house. Chinese New Year in the countryside was the best. My grandma and grandpa killed a pig for the family, uncles and aunties stayed up late to make blood sausages and stuffed trotters, and all the kids ran around in the snow as deep as our heights with candle lanterns. We didn't build snowmen; we made snow castles and tunnels. The whole pig from nose to tail was consumed by us in different forms during the next three weeks of celebration. We had braised shank, pig-head jelly (very much like head cheese), red braised pork belly, and pork jiaozi dumplings on New Year’s Eve, the most important family meal of the year. There was blood sausage and more pork jiaozi dumplings on New Year’s Day. Jiaozi filled with different part of the pig and preserved napa cabbage was the staple for every dinner." What do you like to eat for Chinese New Year? "For Chinese New Year, as northerners, we have to have jiaozi dumplings on our New Year dinner table. We have the tradition of staying up, counting down to the New Year, and folding jiaozi together as a family before we cook them and eat right at midnight of New Year's Eve to represent a New Year filled with luck and prosperity. Because my husband is Singaporean-Chinese, we also have yusheng, a Singapore Chinese New Year dish on our table. It is a salad with sliced raw fish. The family comes together to toss the salad and then moves on to enjoy the feast." "Mornings of New Years are the most exciting time because the kids always put on brand-new clothes, from jackets down to socks. And you start going around the room to say Happy New Year to the elderlies and gather red envelopes with stacks of brand-new one-hundred RMBs in them. Even my parents will get red envelopes from my grandparents. And it's funny because my grandpa is cheap and he only gives out red envelopes if you let him hit you on the bottom of your feet. (It symbolizes you can run fast and succeed in life.)" What do you like to cook and/or eat for Chinese New Year? "On New Year’s Day, we eat dumplings. It's a team effort, so the whole family does it together. Grandma is the only one in charge of making the filling. And no matter how many times everyone makes dumplings together, no one else can do it like my grandma. After dinner, we would gather around the TV and eat tons of tangerines and sunflower seeds while chatting." "When I think about Chinese New Year, my thoughts bring me back to my childhood. Although I love the firecrackers, the music, the lion dances ... my absolute favorite memories are of the feast. 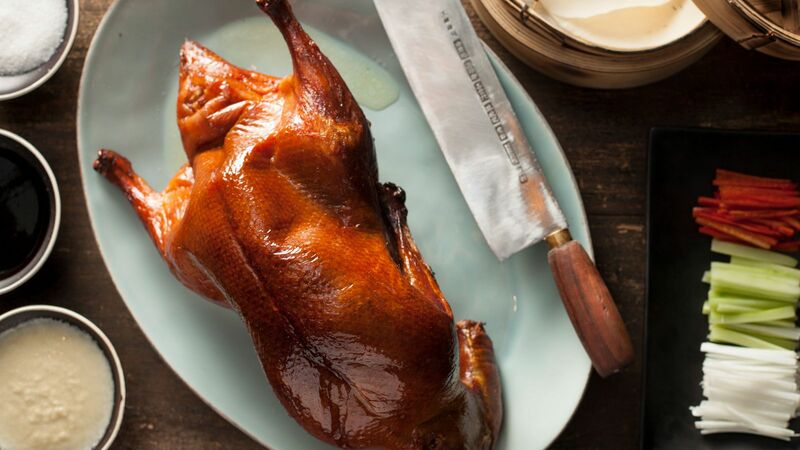 Roasted goose, whole king crab, dumplings, abalone, glutinous rice rolls, and more would completely fill several tables. It was usually the best meal of the year." "Every year at Fat Choy restaurant, I'll celebrate by cooking a special dinner for about 40 guests. We'll always have whole steamed fish, nian gao, spring rolls, and tang yuan cooked up. This year, our dinner will be centered around a suckling pig." "All my family, no matter how busy we are, always gather around my grandparents' house during Chinese New Year. Everyone would wear pajamas, sit around the TV, and watch random Hong Kong comedy shows. Some relatives would sit around a mahjong table playing. After eating, everyone would go to the riverbank to play light fireworks. The feeling of togetherness is my most precious memory." "What my family must have on the Chinese New Year dinner table are handmade fish cakes, sweet chicken soup, and rice cakes with soybean powder and brown sugar. Dumplings are also a must, and we would make them together." "I remember the Chinese New Years of my childhood to be a blur of celebrations carried over several weeks; most Chinese families celebrate the New Year with at least a week’s worth of customs and rituals. One day is dedicated to visiting relatives, another for spring cleaning. One day is named for breaking taboos, another my parents had explained as 'Everybody’s Birthday,' and we all got cake. But all of this would always begin on Chinese New Year’s Eve, with the entire extended family around a large table filled with meat braises, vegetable stir-fries, steamed seafood, and rice. This was the annual family-reunion dinner. Everyone would chip in, everyone helped cook, and everyone looked forward to that one uncle’s omelettes and another auntie’s mango pudding." "There are a couple of traditional dishes that almost every family has on the table during Chinese New Year. Many of the dishes are symbolic of good fortune via fortuitous puns. On the first day of the New Year, for example, families traditionally eat dumplings, which are shaped like ancient Chinese ingots and signify wealth with the New Year. Tang yuan, or sweet rice dumplings, mimic the round family table in shape and signify family unity. But one of my favorite things to make for the New Year are gao, often translated as cakes. As a homonym for 'high or tall,' gao are symbolic of a 'higher year to come.' The most popular variation is nian gao, which is sweet, sticky, and made from glutinous rice. My grandmother is known in my family for making luobo gao, or radish cakes: savory, silky cakes made from daikon and Chinese sausage, which are often available pan-fried at dim sum year-round." "Gathering around the family table and eating hot pot on New Year’s Eve. We would have all kinds of thinly sliced beef, pork, shrimp, fish balls, quail eggs, napa cabbage, shiitake and enoki mushroom, tofu, green onions, Taiwanese cabbage, bean-thread noodles, and mizuna. We would make a sauce out of 'Chinese BBQ' sauce and a raw egg. We would eat the leftovers for the next couple days. We would get red envelopes from our parents and relatives and count all the money. We would go outside and play with fireworks." "I try to recreate our childhood with my two brothers and our families. We continue the same traditions minus the fireworks. A giant hot pot party!" "My favorite Chinese New Year memories are from when I was a kid. In Chinese culture, it’s tradition to receive lucky money and let off fireworks, which were my favorite activities. The fireworks are believed to ward off evil spirits, and the lucky money brings happiness and blessings to those who receive it." 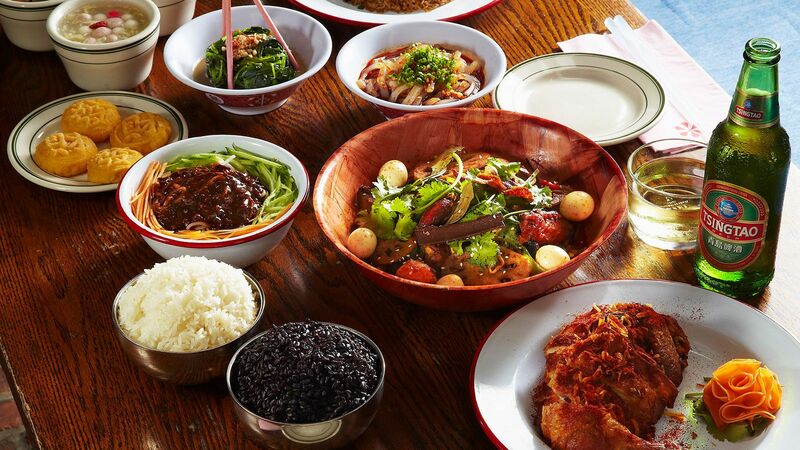 "I don’t like to choose one meal to eat for Chinese New Year, so I make a variety of dishes that fill the whole table. Fish is the most common 'lucky food' to eat during Chinese New Year as it symbolizes an increase in prosperity, so I’ll cook a variety of seafood choices, but I also make chicken and duck for my family to enjoy." "I like to eat noodles—glass noodles like Chinese japchae—and hot pot."